Dolffanog Fawr offers 4 ensuite bedrooms all decorated to the highest standard to give a traditional yet contemporary feel. 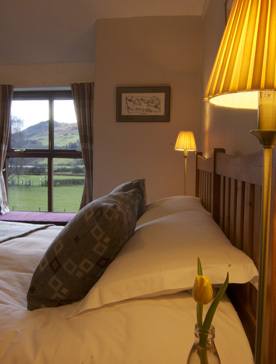 All rooms have large pocket sprung beds, luxurious Egyptian cotton linen and contemporary welsh woollen throws. The rooms also have LCD or LED televisions, alarm clock radios and tea and coffee making facilities. Three of the rooms have large window seats from which to admire the stunning views. We pride ourselves on creating accommodation with a warm, relaxed atmosphere and an exceptionally high standard of comfort and cleanliness.